The Canon Rebel T5 is Canon’s current budget oriented DSLR camera. 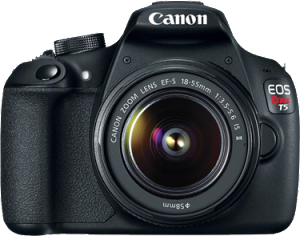 Featuring the same 18mp CMOS sensor of other recent Canon DSLR’s from the Rebel series and up to the 7D, the image quality is excellent. Because of the budget price, there are some features that the camera will be lacking when compared to the Rebel T5i, but when compared to some of the other cameras in the same price range it competes fairly well. The Rebel series of cameras have long been among Canon’s smallest and lightest DSLR cameras. The Rebel T5 is very similar in the ergonomics of the other Rebel series cameras, but Canon has obviously reduced the build quality to help bring it down to a price point. Some people will argue that the grip is too small while those coming from a point-n-shoot may feel it is too big. The T5 does feel quite “plasticky” and not as solid as the upper Rebels, but given the current pricing this is understandable. I am not a fan of the feel of the REbel in my hands, but your mileage may vary. It is worth holding the Canon Rebel T5 and other cameras in the same price category and pick the camera that is most comfortable to you. Canon’s 18mp CMOS sensor has been around since the Rebel T3i and used in several other DSLR cameras including the original 7D and the 60D. This is not a bad thing since that chip has really proven itself over the years. While many of the Canon T5 competitors are using 22 and 24 Megapixel sensors, most people will not notice the difference in prints up to 16×20 or possibly even larger. The Rebel T5 uses Canon’s 9 point AF Sensor and the center point is cross sensitive, meaning it is sensitive to both horizontal and vertical lines. The AF system relies on the lenses for the focusing motors, so the lens will have a lot to do with the speed and accuracy as well. The Canon EOS Rebel T5 does offer a good amount of direct control for those who want to get out of the Automatic and Scene modes. The screen is very low resolution at 460k dots. The price point is great for those on a tight budget that want to step up to a DSLR. The body is a little too plastic feeling, and not the quality plastic like it\’s siblings, the Rebel T5i. The frame rate is among the slowest in it’s class and it uses a smaller, less powerful battery. Additionally it does not offer an Infrared Remote option, which is disappointing. Initially I was not terribly impressed with the Canon T5. I felt the price point was too high and the Rebel T5i was not much more. But in light of recent price drops the value on this camera is A bit better. This camera is good for High School or College students who need a DSLR for a photography class, or for young families on a tight budget but still want the quality and flexibility of a DSLR camera. However, if you are not locked in to Canon Lenses and Accessories, I would strongly recommend you look at the Nikon D3200. It is curretly a little more (About $50) but there are some pretty big differences that are worth checking out. based on 1123 user reviews online.